The dress I’ve got to share with you today has been a real labour of love and I enjoyed every single second of making it. Even the whole day spent fitting the bodice! I like nothing better than a reason to sew myself something special and challenging and what better reason could I have than the wedding of my step-sister 10 days ago? I mulled over what I wanted to make for over a year and bought the fabric long before I decided on a style and pattern. 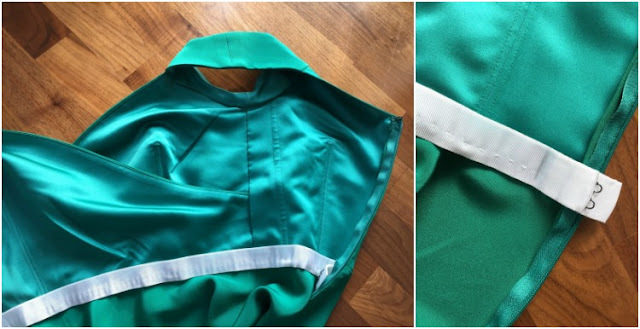 When I visited Mood Fabrics NYC last April I spent a good hour pawing at bolts in the glorious silk section and when I glimpsed this vibrant Kelly Green 4 Ply Silk Crepe it was love at first sight. It has got the most amazing thickness and weight to it combined with such a luxurious drape and sheen. Its similar to what I would call a silk morocain here in the UK. At $35/yard it was a real treat but similar silks this side of the Atlantic are likely to cost double. I on the spot decided that this was going to be used for my wedding outfit and bought 2.5 yards which turned out to be plenty for this design. I might even have enough left to piece together a slinky cami if I’m lucky. I’ve wanted to make B5814 (one of Gertie‘s designs for Butterick) for a really long time; I think I’ve had it pinned to my sewing pattern wish list on Pinterest since it was released! The one thing stopping me, apart from an occasion to wear it) was that I wasn’t totally sold on the style of the skirt with the pleated drape at the hip. Once I had chosen the silk I pretty much ruled the pattern out as I wanted a style that would make the most of the amazing movement in it. Then it occurred to me one day that it would actually look beautiful used for the pleats of the bodice and I could switch out the skirt for a simple flippy half circle. The silk was going to need some support to maintain the lovely crisp lines of the bodice so I underlined all the bodice pieces and sleeves with silk organza. I love doing this and find hand basting the pieces together so therapeutic. The organza has given just the right amount of structure to the bodice shape but still allows the pleats of the bodice to fall in lovely soft folds once the basting stitches were removed. I really wanted to go all out and make this dress the best it could be so I even used proper basting thread for the first time which breaks fairly easily to make it more simple to remove. I also actually used beeswax for all my hand sewing and was blown away by the difference it made. It certainly made those two hours hand sewing the hem more pleasant! Looking at the sizing on the envelope I cut a muslin using the size 10 bust and 12 waist. I read a whole heap of fitting advice on Pattern Review which almost put me off! I went in with the mindset that I was going to need to send some time on the fit and was actually pleasantly surprised. 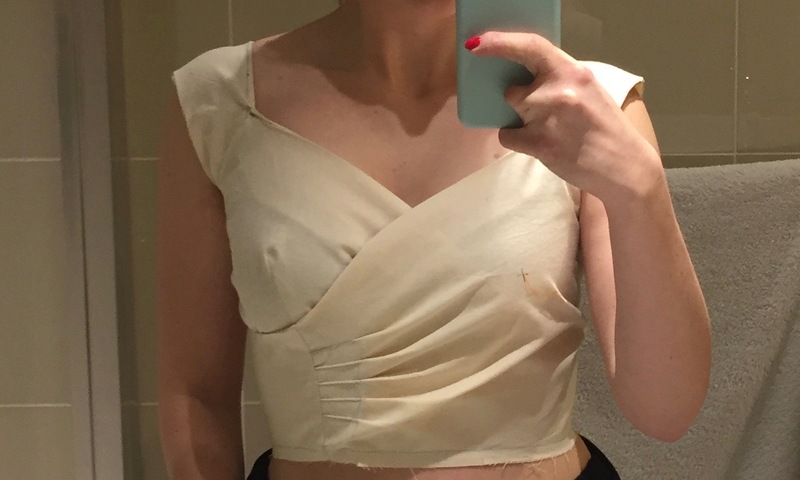 Yes I needed to raise the neckline (Gertie herself says its not a modest dress) but it was amazing at how secure and comfortable I felt in the first muslin despite how exposed I was! To make this alteration as straightforward as possible I measured and wrote on the muslin how much higher I wanted it to be at various points across the front. The most was 1″ at the centre front. I then added paper behind my pattern pieces, marked these points and joined them all using my french curve, grading to nothing at the ends where the edge meets another seam. I liked the way the right bodice piece dipped down under the left bust so didn’t add any height there. The rest fit so beautifully that the only other change I needed to make was to get the sleeves to stay put on the shoulder. Gertie’s fitting post was invaluable to me at this point and the changes I made were pretty much exactly what she suggests. I pinned out a bit at each front raglan sleeve seam and pinned a wedge at the top so it fitted the curve of my shoulder then transferred those adjustments to the pattern pieces. If you are going to follow Gertie’s advice take note that in her pictures she shaves of a wedge in the wrong place on the second one. 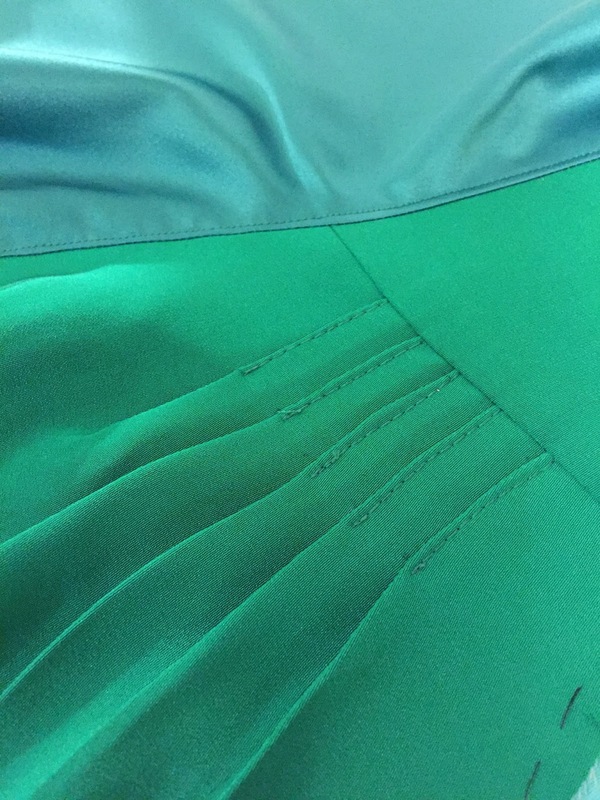 You need to change the shape of the seam where the sleeve meets the bodice, not where the sleeve meets itself under the arm. Its pretty easy to get muddled at various points with these small bodice pieces so I was glad I made a muslin just to practice the construction! The sleeves fit so well now; not too tight or loose. Each adjustment was only tiny but made a huge difference. 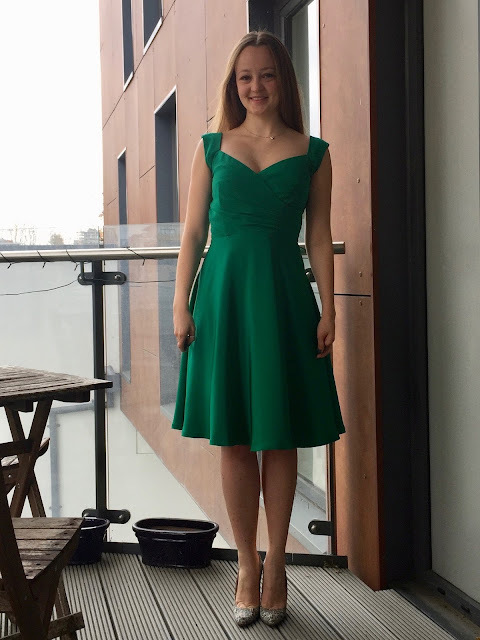 The neckline is quite wide so I expected to have to wear a strapless bra but I was pleased to find I could away with my normal one which has wide set straps. Its flesh coloured so if anything did peek out as I moved around you wouldn’t really notice. As I mentioned the fitting did take me a whole day as I made a second muslin to check my adjustments, inserted zips in both and painstakingly transferred all markings. These included seam allowances so I could press down the top edges accurately and bust point and waistline markings so I could accurately assess fit. 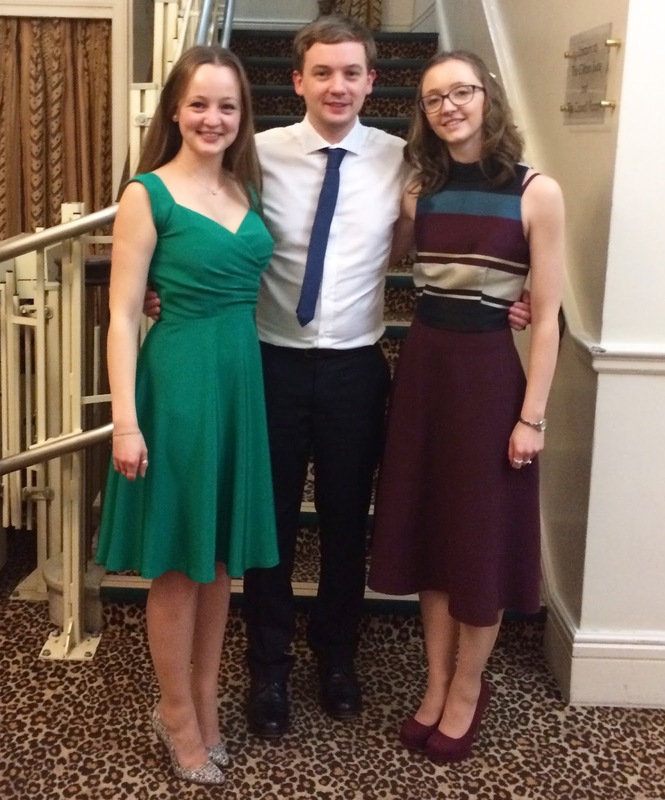 All that time fitting was absolutely worth it to be able to forget I was even wearing something so special whilst whirling around dancing a ceilidh! I was wonderfully comfortable and happy in it all day. The time taken on fitting a muslin gave me more confidence when the time came to cut into my fabric and I enjoyed the whole construction process even more knowing I had a dress which was going to work. 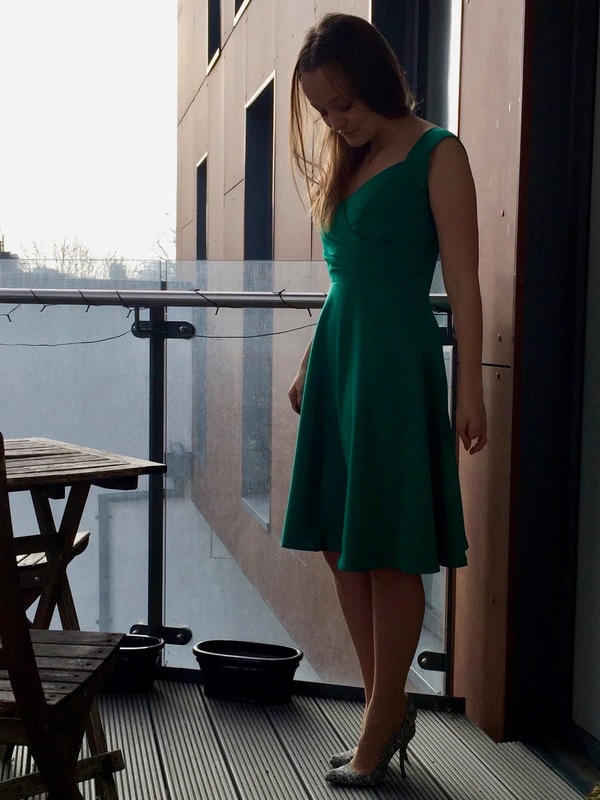 A couple of days after cutting I went to see La La Land and like most of us was drooling over the dresses when I realised that what I was making was very similar to Emma Stone’s green date night dress! Total happy accident that gave me even more confidence in my choices. Looking at pictures of that dress and the way it moves I’ve got my suspicions that this very fabric might have been the one used!